Each OP's Info Pop-up - The Cook time and Cook counter of each OP can be displayed in the Info pop-up of each OP. Use the middle mouse on the icon of any operator. Performance Monitor Dialog - The Cook time, Cook counter, Viewport display times, User Interface compute times, and more can be logged in the Performance Monitor dialog. Click the Analyze button to get a snapshot of what is happening in your synth. With the Performance Monitor you can also trigger a dump on frames that exceed a certain threshold, explained below in Frame Trigger. You can also use probe in the Palette to watch network cook times live. Use Frame Trigger in the Performance Monitor to catch frames that take a long time. If you enter a frame time limit and click Analyze then it will only report on the first frame that goes over this frame time. If you notice that only particular frames seem to take a long time to cook (TouchDesigner seems to freeze up at certain frames), you can use the Frame Trigger to capture the sequence of cooking for a frame that exceeds the cook time threshold. For example, while TouchDesigner is playing forward, type 100 in the Frame Trigger and then press Analyze. 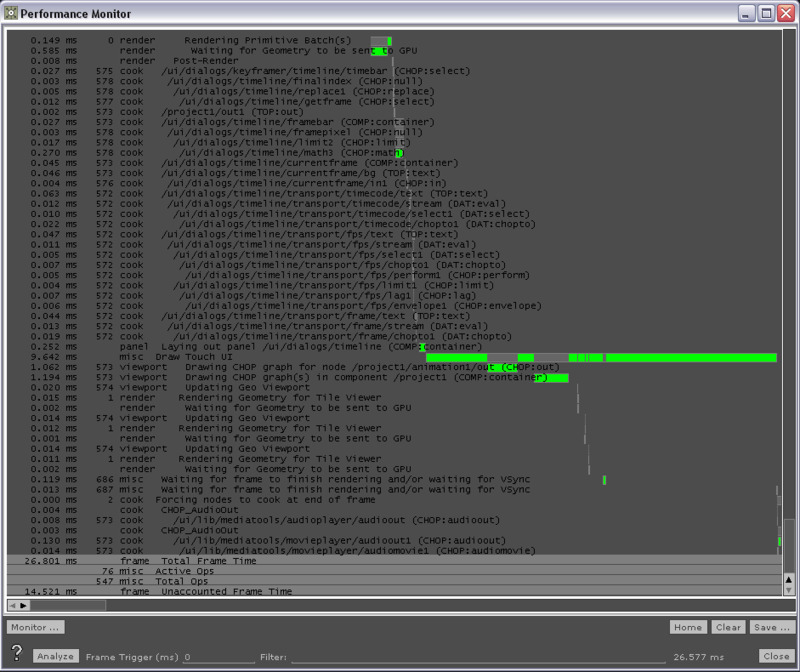 The next time a frame takes longer than 100 ms to cook, the performance monitor will report a list of monitored items. It is probably best to sort the list by Adjusted Length in which case the longest cook will appear at the bottom of the list. This output can also be saved to a text file. Note a 30fps system will take ~33ms each frame and a 60fps system will take ~16ms. probe in the Palette also helps identify fluctuations in cook time. This page was last edited on 4 October 2018, at 10:16.